With organic agriculture already a $31 billion annual industry just for food and beverages, a Berks County research farm is seeking to partner with businesses and organizations to further promote healthy eating. 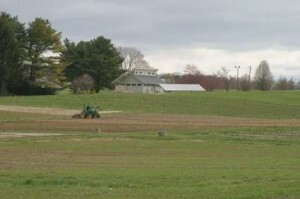 Behind executive director Mark Smallwood, the Rodale Institute in Kutztown started a new model called the Agriculture Supported Community which targets food deserts and underserved communities, said spokesman Aaron Kinsman of the institute. A food desert is a geographical area where residents have little access to a healthy, affordable food. “This program has done very well for us; we distribute to Allentown, Reading, Bethlehem, Easton and here at the farm for 200 families,” Kinsman said. Allentown Mayor Ed Pawlowski is working with Rodale Institute on an initiative to bring organic agriculture to vacant lots and open spaces in the city to create access to people who normally wouldn’t have it. This initiative is in the planning stages but should launch in 2015. Smallwood, known as “Coach,” became inspired by the organic movement as a child and noted that his grandmother was a driving force. As his career progressed, he became a teacher and basketball coach. Smallwood started consulting for the green industry and became a local forager for Whole Foods, which helped to achieve a 90 percent diversion rate from the grocery chain’s landfill. He stayed with Whole Foods for six years before joining Rodale Institute, where he is in his fourth spring growing season. “Here, change is widely accepted; innovation is widely accepted,” Smallwood said. The institute conducted a 33-year farming trial where it grew conventional soil next to organic soil and compared results. Among other data, the trial found that organic farming uses 45 percent less energy and is more efficient. Also, conventional agricultural systems produce 40 percent more greenhouse gases. As an example, farmers who do organic agriculture have to document everything they do, whereas those who do “traditional” agriculture are not required to, according to Smallwood. Interest in organic products, from food to cosmetics, is exploding. Last year, all organic agriculture in the food and beverage industry grew to $31 billion. Ten years ago, it was at $8 billion, Smallwood said. Read the rest of the story via Organic farming as a business opportunity | Lehigh Valley Business.